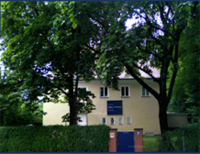 Our office is situated in a villa near the centre of the city between Baldeplatz and Roecklplatz, in the "Isarvorstadt". It is situated 3,5 km south of the main station and 2,9 km south-west of Marienplatz. Bus 131 (Viktualienmarkt - Theresienhöhe) till "Roecklplatz". Head in the direction of Wittelsbacherstraße / Baldeplatz. You will find us after 100 meters on the right-hand side of the street. Bus 58 (Hauptbahnhof - Silberhornstraße) till "Baldeplatz". Follow the Wittelsbacherstraße in the direction of Roecklplatz. You will find us after 500 meters on the left-hand side of the street. We dispose of a private parking behind the villa. Acces by Hefner-Alteneck-Straße (formerly Wittelsbacherstraße).